WINNIPEG - Manitoba is preparing to deliberately flood a swath of land and threaten 150 homes as it struggles to contain a torrent of flood water coming from Saskatchewan. Premier Greg Selinger told a hastily assembled press conference Friday night that more water is pouring into the province than officials predicted just a few hours ago. "We've seen the water move more rapidly than anticipated, at higher levels," Selinger said. "Preparations are underway for a controlled breach at the Hoop and Holler Bend to reduce the high possibility of an uncontrolled breach." 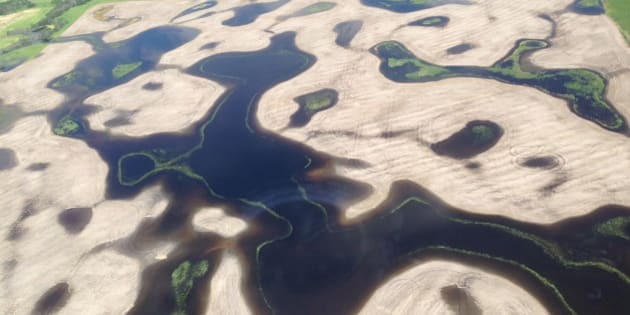 Selinger ordered the same measure in 2011, deliberately flooding the same 225 square kilometres and threatening 150 homes to save hundreds more downstream. Work preparing the cut is expected to begin Saturday with a deliberate breach coming as early as Monday. The move came just hours after Selinger declared a provincial state of emergency and called on the Canadian military to help protect 200 rural homes from a surge of floodwater coming from Saskatchewan. The summer flood caused by torrential rain last weekend could topple records set in 2011, Selinger said. "We've updated the Canadian Forces with these new projections and the need for more resources, more quickly," he said. "Our priority remains ensuring the safety of Manitobans and doing everything we can to protect homes and businesses." Selinger said he spoke to Prime Minister Stephen Harper on Thursday to brief him on the situation and decided the province needs military help to shore up dikes along the swollen Assiniboine River. The military will help fill up to one million sandbags needed to protect vulnerable properties west of Winnipeg, he said. The province has two million sandbags in stock. Reservists will also move quickly if dikes are breached and have special equipment to get into isolated areas, Selinger said. He didn't know how many troops would be deployed but the first wave will come from Canadian Forces Base Shilo in Manitoba. They are expected to be on the ground Saturday. The military did not immediately return a request for comment on details of their flood-fighting role. Lee Spencer, executive director of the Manitoba Emergency Measures Organization, said time is of the essence. Military help will get the province through the "first crunch" before the river crests, then help maintain the integrity of the dikes, he said. Although the province has pumped $20 million into beefing up flood protection in the region, the area is still vulnerable. "There's 160 kilometres of provincial dikes out there and they are about 100 years old," said Doug McMahon, assistant deputy minister with Manitoba Infrastructure and Transportation. "They take a substantial amount of effort to maintain flows on them for significant periods of time." People living along the river have been told the water level could swell half a metre above where it was three years ago. The 2011 flood was one of Manitoba's worst, as army reservists scrambled to help shore up weakened dikes and sandbag homes along the river. The province is forecasting similar flows this year when the crest arrives from Saskatchewan as early as this weekend. The crest is expected to move through relatively quickly, though, in a matter of weeks as opposed to months. "The good news is people know what they're doing," Selinger said. "They've been through it unfortunately before, three years ago. We're all seized of the need to work together and we will be working very closely together to manage this as we go forward." Robert Poirier, chief administrative officer of St. Francois Xavier municipality west of Winnipeg, said people who live along the river there were told after the 2011 flood to put in permanent flood protection. But he doesn't know how many took that advice. Unlike the 2011 flood, which was the result of spring runoff, Poirier said they haven't been sandbagging for months and aren't prepared for a flood-fight this late in the year. "There is a bit of anger, a lot of resignation," Poirier said. "In 2011, the province had been busily making sandbags for four months, as had we. We consumed something on the order of more than 200,000 sandbags over the course of a week or two." Roland Rasmussen, reeve of the rural municipality of Cartier, said he hasn't been told about any military help coming his way. But he said people in the area are mobilizing and sandbagging to protect about 50 vulnerable homes along the river. Many of those residents still have watermarks on their trees from the 2011 flood, he said. Three years ago, people prepared for a high-water mark that never came, he said. "Anybody who was there three years ago in a house and had lots of room before the water got near them, they're more than likely going to be fine," Rasmussen said. The situation was changing rapidly. The city of Brandon revised its flood forecast overnight. The crest was initially expected to hit the city late next week but officials now say it could arrive as early as Saturday. "We should see the water recede slightly for a couple of days, peak again, and then remain for a couple of weeks," the city said in a flood bulletin late Friday afternoon. "This is a new type of flood and therefore very difficult to predict." Brian Kayes, the city's emergency co-ordinator, said Brandon expects it will be protected by its permanent dikes but people living north and south of the Assiniboine River will receive pre-evacuation notices over the weekend. They will only be told to leave if a dike is breached or if the city receives torrential rain that overcomes the sewer system, he said. Torrential rain and flash floods last weekend prompted more than 100 communities in Saskatchewan and Manitoba to declare a state of emergency. About 300 people in Saskatchewan and 698 people in Manitoba have now had to leave their homes because of overland flooding. Emergency Measures Minister Steve Ashton said the rain fell on soggy ground. Manitoba had received record amounts of precipitation in the spring, which saturated the soil. The situation appeared to be improving in Saskatchewan. Water started to recede in communities and move through the river systems toward Manitoba. Federal Defence Minister Rob Rob Nicholson said in a statement late Friday that the military is coming to the aid of stricken communities. "Our thoughts and prayers are with those families who have been affected by the recent flooding in Manitoba. The Canadian Armed Forces are being deployed to ensure the safety of Canadians and assist communities in their time of need," he said. No details concerning the military aid were provided, however, a followup statement with more information was expected sometime Saturday. Steven Blaney, minister of Public Safety and Emergency Preparedness, said the government operations centre is co-ordinating the federal government's response to Manitoba's request for assistance.